Geguri, one of the Dragons’ newest players, walking on stage last night. Kim “Geguri” Se-yeon finally made her debut for the Shanghai Dragons last night, a huge deal—the first game ever for the first woman in America’s most prominent esports league yet. And like every other match they’ve played in the Overwatch League, the Dragons got trounced, this time by the Dallas Fuel. But there were some signs of progress; after winning two maps total in their 10 stage two matches, they already won one last night. Five of the six Shanghai players last night were new additions to the team. In addition to Geguri, the Dragons also had DPS duo Chon “Ado” Gi-hyeon and Kim “Daemin” Daem-min, main tank Lee “Fearless” Eui-seok, and support He “Sky” Junjian. It was a full overhaul of the last two stages, and hopes were high. From the pre-game desk to the crowd, there was support for the Shanghai Dragons to finally get that first W against Dallas. And boy, did the Dragons start strong. A quick first-take of point A on Volskaya for the Dragons turned a little south, the teams switched sides and Shanghai set a surprise defense that caught the Fuel out. The surprise jump was a clever play, one that shows cohesion and forethought on strategy. It was fun to see! Effect still took some possession on the point, but it should have set Shanghai up for success with a quick burst of ultimate charge. Things fell off quickly after that, though. Dallas started to run over the Dragons. The Fuel’s Hwang “Effect” Hyeon had repeated standout games, putting up huge numbers. His fellow DPS player Dylan “AKM” Bignet also had some big moments, racking up hacks as Sombra and on Numbani, using Soldier 76's auto-aim visor to brutal efficiency. Even after the outcome was clear, though, Ado was a hero on Genji, Geguri had solid D.va pick-offs, and Daemin found his groove in map 3 on Tracer. But standout moments were swallowed up by consistent achievement from the Fuel. The supports in particular looked lost, getting picked off by Effect and AKM and failing to make the big plays when needed. Obviously, Geguri’s debut was the talk of the night, and her first match on the Overwatch League stage was pretty good, with a few great moments. Her D.va was effective both in and occasionally out of mech as she chased down Effect’s Tracer and nullified Pulse Bombs with her Defense Matrix; overall, she was a major upgrade at the position for Shanghai. 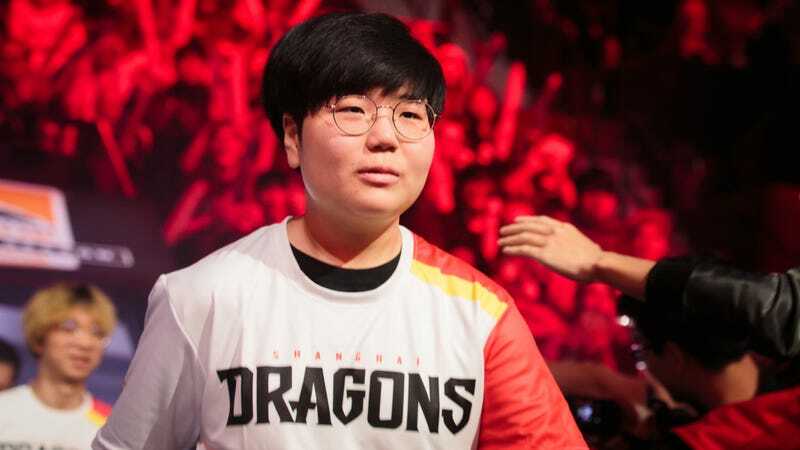 Both Fearless and Geguri sometimes staggered and had issues coordinating their tank play, but that’s a small part of the overall issues the Dragons have playing together comfortably. Dallas won the first three maps, and it looked like this would be the 14th time in 21 matches that Shanghai would fall to a 4-0 sweep. But on Junkertown, the team started to click behind Fearless’s excellent Roadhog, and at the last second, they held the second point. The team is still winless at 0-21 overall for the season despite breaking its map loss streak on Junkertown. Inconsistency and lack of cohesion—to be expected when a bunch of new players join a terrible team—were the biggest problems for the Dragons last night, and that can’t get fixed overnight. The Shanghai Dragons are still winless, and with its upcoming schedule against the Valiant, Gladiators and Shock, things will likely stay that way for a bit. But with its new additions, the new-look Dragons have a glimmer of hope about them. The wins won’t come now, but they seem like much more of a possibility than they did just weeks ago.